BBC launched CAPE (Create a Positive Environment) initiative in 2014 to study the knowledge and attitude towards neurodiversity. Neurodiverse individuals are those with hidden conditions such as dyslexia, dyspraxia, dyscalculia, ADD/ADHD and Autism Spectrum Conditions. Create a digital solution to enable a neuro diverse person with difficulty navigating to go to a gig. ​Based on user feedback, we developed the concept of the app ‘Get there’ paired with two smart vibrating wristbands. People with Directional Dyslexia typically have difficulty interpreting directions and orienting themselves. 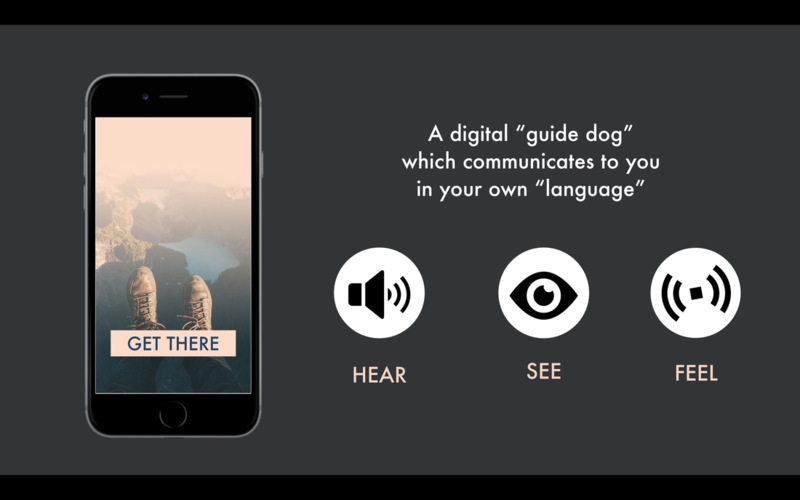 This app allows them to get navigation instruction in three different modes : hear, see and feel. They can activate any one of these three modes at any time. See: The visual instructs are based on augmented reality where the arrows show up in relation to the street image. Feel: This mode activates the vibrating wristbands. Instruction on which way to turn are indicated via a sequence of vibrations on the corresponding wristband in relation to the user’s current location. We were impressed with the level of engagement from the students following the initial brief. Their enthusiasm to understand more about the topic was infectious, which was heartening to us as clients as this subject is very important to us both from a professional and personal perspective. Each individual team member could demonstrate the level of knowledge they had acquired and everyone presented initial ideas and prototype examples clearly and articulately. We were also impressed at the level of user-led research they had been able to identify and utilise to add depth to the review sessions. Following the two-week brief, each team then presented back their final products, to their peer group, to us and to another external collaborator of ours who we have worked with on our project previously. The final product pitches were delivered professionally and demonstrated not only an understanding of the subject, but also a compassionate empathy for the potential end users of their products. We were impressed with the innovative ideas delivered and with the mix of low and high technology solutions which catered to every level of budget. Having taken delivery of these final products, we are extremely keen to be able to use them for our project as soon as possible. Great work, a great experience for us and thank you again to everyone. It was hard to find users from existing networks because this is an invisible illness often with some stigma attached to it. After lots of googling, we found a NY times story about a woman who had difficulty navigating. This article pointed us to the private forum where others with similar conditions discussed their day to day difficulties. We learned that the term ‘Developmental Topographical Disorder’ was coined in 2009 to identify this condition. There we also found out other names that we could use to identify facebook groups where more users gathered together. Through research, we understood that a clinical diagnosis for this condition 'Developmental Topographical Disorientation' (DTD) was coined in 2009. Armed with a deeper understanding of the user, we framed our problem statement. According to individuals with DTD, existing navigational tools like google maps and apple maps had major handicaps in its ability to meet their needs. We used ideation techniques - random word association and lotus blossom - to generate ideas for solutions. Round 1: A vibrating device that translates maps through a haptic feedback on when and what direction to turn. Round 2: Different modes of navigational instructions to suit your environment. Round 3: A combination of the first two solutions. The number of modes were reduced to three. Round 4: Refined the interface and features further based on user inputs. We made low-fi videos of our prototypes and shared it with users and experts to gather their feedback. We sent out interview requests in the first week and scheduled them to inform different rounds of testing. After gathering final round of feedbacks, we consolidated our findings into the concept presented in the final pitch. 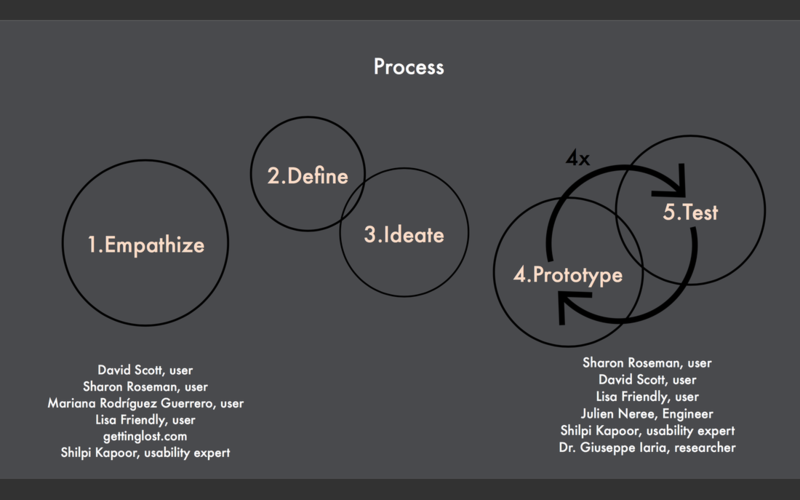 Read critical review on Design Thinking and group project here.